UFC 211 is quickly becoming the biggest fight card of the year as the promotion has stacked the event with some of the best matchups possible for its return to Dallas. In a rematch of one of the best heavyweight fights in recent memory, Stipe Miocic and Junior Dos Santos throw down in the main event of UFC 211, this time with UFC gold on the line. 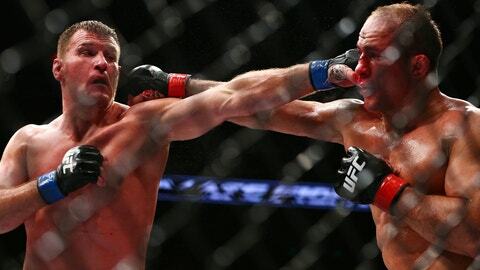 Since their epic 2014 “Fight of the Night” bout, Miocic has won four straight fights, all by way of knockout while JDS is coming off a win against Ben Rothwell where he landed a career-high 157 significant strikes. If this bout is anything like the first one, fans will leave the American Airlines arena happy. The UFC’s longest reigning current champion puts her title on the line against Brazilian strawweight Jessica Andrade in the co-main event of UFC 211. Jedrzejczyk has been dominant during her time as champion but has yet to face anyone with the power and ferocity of former bantamweight Andrade. This matchup will test Jedrzejczyk in ways she hasn’t seen inside the Octagon, but the champion has shown time and time again she's up for any challenge. 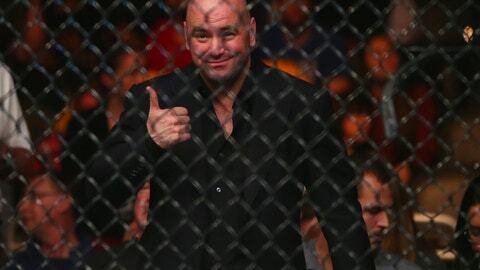 The UFC hasn’t outright said this fight is a No. 1 contender’s bout, but it seems likely that the winner of will go on to challenge for the welterweight title next. Maia has defeated everyone from Carlos Condit to Matt Brown during his recent six-fight win streak and is hands down the most deserving fighter of a title shot in any division. Instead of waiting around, however, he’ll take on Masvidal, who has won three straight and is coming off a blistering TKO of Donald Cerrone in January. 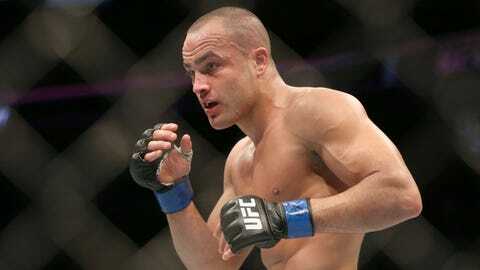 Former lightweight champion Eddie Alvarez jumps back into the fire with a hard-hitting matchup against Dustin Poirier. Poirier is 5-1 since moving up to lightweight and has looked like a future champion in the division at various times during his run. He’ll take on a brawler in Alvarez, who looks to re-enter the title picture after losing his belt to Conor McGregor at UFC 205 last November. Sergio Pettis faces his toughest test yet as he squares off against former Olympian Henry Cejudo. Pettis, the young brother of former champion Anthony Pettis, is only 23 but has already been fighting under the UFC banner for more than three years. He’s reeled off three straight wins at flyweight -- all in convincing fashion -- to earn the bout against Cejudo. 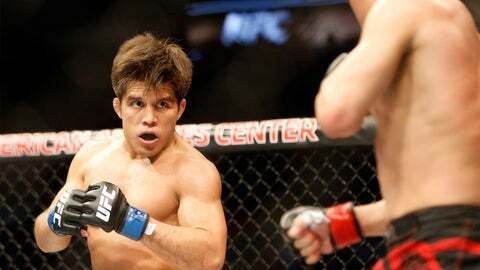 Cejudo is coming off his second straight loss -- a split decision to Joseph Benavidez -- and needs a win if he wants to hold on to his spot in the flyweight top 5. 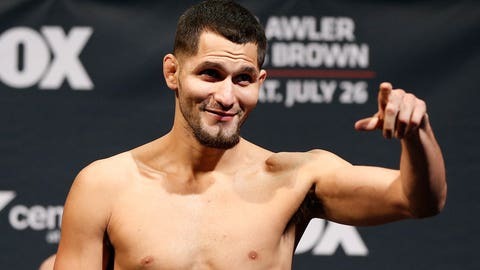 Yair Rodriguez’s beatdown of BJ Penn has squarely placed him in the UFC featherweight title picture as he takes on former champion and perennial title contender Frankie Edgar in a premiere matchup in the 145-pound division. Rodriguez is one of the promotion’s brightest up-and-coming stars while Edgar has long been a fan favorite and the winner here could position themselves perfectly for a title fight later this year. James Vick and Marco “Polo” Reyes are slated to throw down in the ever-exciting striker vs. striker matchup. In just three UFC fights, Reyes already has “Fight of the Night” and “Performance of the Night” bonuses under his belt and has yet to be outstruck in the Octagon. Vick, a Texas native, has won six of his seven bouts inside the UFC and knows a win here could propel him into the lightweight top 15. TUF Latin America season one competitor Gabriel Benitez faces season two winner Enrique Barzola. Barzola was down-right dominant in his last fight -- a unanimous decision over Chris Avila where he scored seven takedowns -- and looks to build upon that success in May. Benitez, who trains out of American Kickboxing Academy, is 3-1 in the Octagon and already has two submission wins on his record.